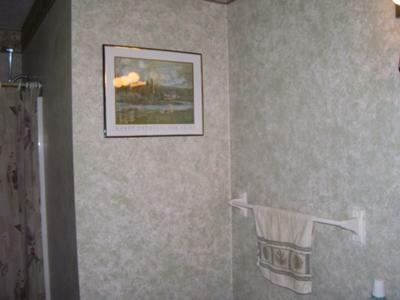 When we first moved into our new house, I decided that I did not want a solid wall color in our bathroom, but my husband was adamantly against wallpaper. We came to a compromise and decided to do a sponge painting technique. He doesn't paint, so I undertook the project. It took a bit longer than I thought for a few reasons - I used five different colors, I used three different sponges, I was doing it in the evenings after work and I had help from my 3-month-old puppy who thought it was fun to run off with whichever sponge was not currently in use. The overall sponging process was not very difficult but it was time-consuming because of drying time between coats. I find green to be an extremely relaxing color, so I used beige and sage hues in my bedroom. I wanted the bathroom to coordinate with it, so I decided to use an off-white semi-gloss as the base color, a light beige semi-gloss and light sage semi-gloss applied with two differently sized sea sponges, and a medium green glaze applied with a "shower puff". Though it is not shown in the photo, I also added a wallpaper border at the top to tie in all of the colors. The finished product was well worth the effort. It has an elegant look to it and everyone who sees it thinks it is wallpaper. Tips: when undertaking a project like this, keep in mind that every once in a while, you have to step back from the wall to get a sense of the overall appearance. Also, choose paint colors that are complementary to one another. For a subtle effect, choose colors that are very close in intensity. For a more dramatic effect, go a few shades darker or lighter and/or work with a few different colors.